Stripes are modern interior decorating ideas that add dynamic accents and energy to room decor. Selecting striped wallpaper patterns and painting stripes on walls, adding striped floor rugs and bedding fabrics, home accessories and tiles are good choices for energetic and optimistic people who appreciate classic designs and enjoy color contrasts. Stripes in neutral or monochromatic colors are an excellent interior decorating ideas for comfortable, stylish and elegant room decor. 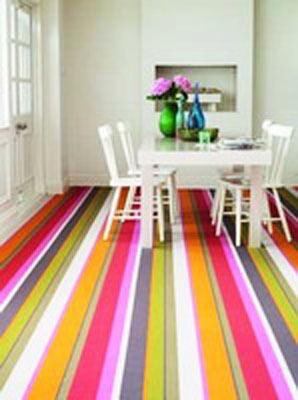 Adding stripes in bright colors is a way to add energy and drama to interior decorating. Choosing striped wallpaper patterns and painting stripes on walls help expand the space visually, balancing rooms proportions. Striped floor rugs and bedding fabrics bring a splash of color and energetic patterns into room decor, filling the space with enthusiasm and creating a sense of movement. 1. Vertical striped wallpaper patterns or painting stripes on walls create pleasant illusions of high ceiling. 2. Stripes add simple and elegant geometric pattens to interior decorating ideas, harmonizing and emphasizing room decor with furniture and home accessories in soft shapes and with smooth curves. 3. 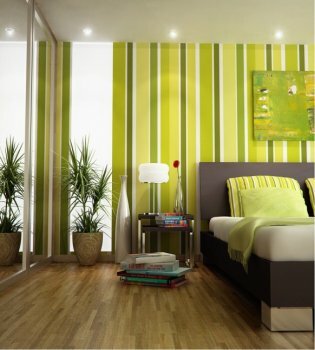 Vertical stripes on the walls make your room look narrower, but airier. Horizontal striped wallpaper patterns or painted stripes on the wall stretch the space, making room look wider and more spacious. 4. Stripes floor rugs and bedding fabrics, window curtains and furniture upholstery fabrics are also useful for creating optical illusions that visually increase living spaces. 5. Modern interior decorating with stripes can stretch the ceiling, walls or floor, creating larger home interiors and more interesting room decor. 6. Striped wallpaper patterns with tiny stripes in neutral or monochromatic colors look classy and elegant. Narrow stripes on walls can create more formal, business like room decor in neautral colors or youthful and playful modern interior design in bold room colors. 7. The thickness and direction of stripes on walls and selected room colors can dramatically transform interior decorating ideas and change the way your room look and feel. 8. Striped rugs and bedding fabrics, window curtains and decorative cushions, combined with neutral wall paint and plain furniture upholstery fabric, give charming and bright look to your lacking any interest room decor. 9. One wall decorating with striped wallpaper patterns or painted stripes on walls create a beautiful focal point for modern interior design. 10. Floor and wall tiles, laminate flooring, carpet designs, decorative ceiling paneling and wooden wall panels are ways to add horizontal and diagonal stripes to your room decor. 11. Add various textures and create vertical stripes, using modern interior decorating ideas with bamboo or striped pottery. 12. Create stripes with wall and ceiling lights, paintings and small wall decorations. 13. Paint doors and windows frames, or decorate windows sill with colorful or white paint to create more atripes for modern interior decorating. 14. Stripes lampshades and decorative throws with pillows are another attractive way to add beautiful stripes to your sofa and chairs, balancing room and furniture design proportions and creating more spacious and comfortable room decor. 15. Hang large bathroom towels with bright stripes, which will attract attention, if your want to make your bathroom look more spacious or highlight one wall decoration.